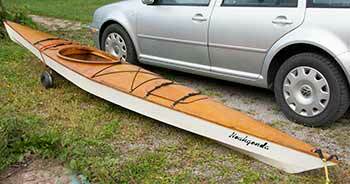 I recently bought this hand made plywood kayak at an estate sale. It's just short of 16 feet and weights about 45 pounds. Not terribly heavy but heavy enough for a stiff old lady like me. It came with a very basic wooden launching dolly. 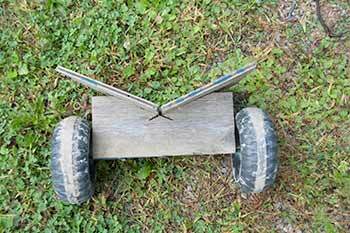 When I saw it I did not think much of it but after using it I warmed up to the ugly little cart. It actually works quite well. Is is also very simple to put together. 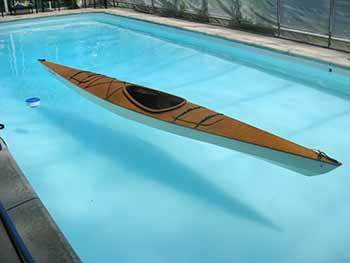 It could easily accommodate a small sailboat or canoe instead of a kayak. The kayak cart is quite small and not very heavy. I attach it to the kayak with a bungee cord. 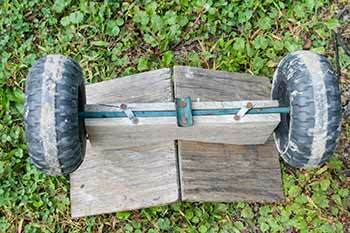 It is made from 2 pieces of half inch plywood, a 2x6 x12 inch piece of lumber, 2 plastic wheels and a half inch metal rod that becomes the axle. The 2x6 has a V shaped notch cut out. The builder obviously used a power saw because the cut marks extend on one side. The notch fits the kayak bottom profile quite well. The 2 plywood pieces are solidly screwed onto the notch. They extend just beyond the bottom edge. On the bottom edge of the 2x6 a slot has been cut. This cut fits the metal rod/axle. It seems to be about a half inch diametre. The axle is held in place with 3 somewhat random pieces of metal screwed on. The wheel is 7 1/4 inch in diametre and 3 inches thick. It looks like it came off a child's toy or an old BBQ. It's hollow plastic. 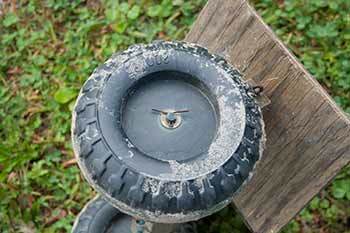 In dry sand the wheels tend to dig in so wider wheels might work better. If you could get the extra wheels, doubling the number of wheels so that each side would work too. 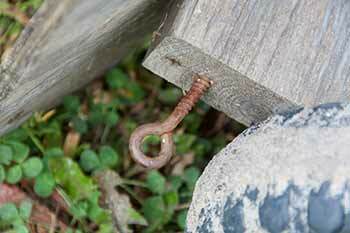 The axle is simply a metal rod with a hole drilled at each end with a cotterpin holding the wheel. 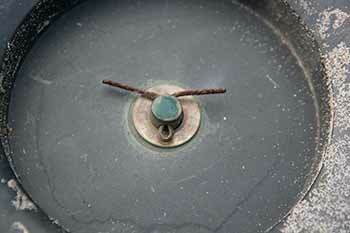 There is a washer between the cotterpin and the plastic wheel. In the end of the crosspiece, 2 eyes are screwed in. 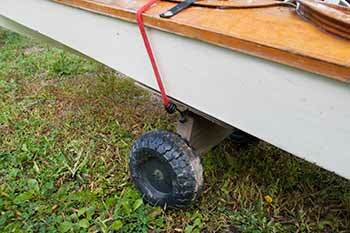 I used a bungee cord to attach the kayak to the cart. It would be very simple to attach a strap and a snap attachment instead of an eye. The kayak has been loaded onto the cart, bungeed in place, and is ready to go to the beach. There is a strap screwed onto the front to act as a handle. One advantage of this ugly but useful cart is that it is not likely to be stolen. I usually just leave it in a quiet corner bungeed to a fence or a tree, while I go paddling. I went Kayaking in Port Colborne, - and went again to explore some more. Crystal Beech and Abino Point Lighthouse makes for a nice afternoon paddle. Black Creek meanders from the Niagara River all the way to Stevensville. It's a nice paddle with lots of herons, turtles, frogs and other water critters. My Ten Knots The 10 knots I use around my boats. I've finally figured out a good assortment of knots that seem to do the job. The First boat launch trailer I made was not strong enough. I reused the materials for the Apple pie dolly. 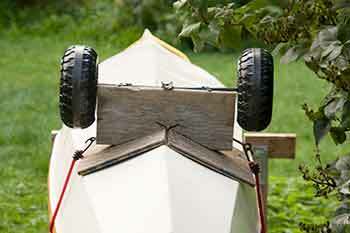 Pride Marine has a page on commercial dinghy dollies. Marine Cradle Shop Inc makes cradles, dollies and trailers for dinghy and boats. My launching Dolly for my Skerry comes from them and I like it. Any boating has risks. Take care, bring the proper safety gear and know how to use it.